Thanks to the selfless work of the developers over at TOR, we are provided with a way to get around the horrible system of data collection in the United States and other countries. Programs like Tor Browser Bundle provide us all with a way to circumvent both censorship and government spy operations. Advanced Onion Router provides an alternative to the Tor Browser Bundle and allows its users to browse the web anonymously. Advanced Onion Router itself will not provide you with a fast Internet connection and it will slow you down a bit, depending on your Internet Service Provide. With that in mind, it is a viable and working alternative to Tor and Vidalia. In contrast to Tor Browser Bundle, Advanced Onion Router provides several advanced options of which are configurable by the user up front. At the end of the day though, the two programs work in a very similar way. Advanced Onion Router just provides an alternative to Tor Browser Bundle. In the configuration of AOR, you can customize many features and the most useful is probably the banning function which is featured prominently. You may also active ISP filtering, blacklisting and advanced settings. Advanced Onion Router also includes a sandboxing feature which can essentially control specific programs and services. Advanced Onion Router is not the best way to use the Onion network, but it certainly is an alternative which may be used and provides a streamlined way to configure usage of Onion browsing. Advanced Onion Router can hide your true IP address and circumvent state censorship. Advanced Onion Router is licensed as freeware for the Windows (32-bit and 64-bit) operating system / platform from anonymous proxy software without restrictions. Advanced Onion Router 0.3.1.5 is available to all software users as a free download (Freeware). Compatibility with this software may vary, but will generally run fine under Microsoft Windows 10, 8, 8.1, 7, Vista and XP on either a 32-bit or 64-bit setup. 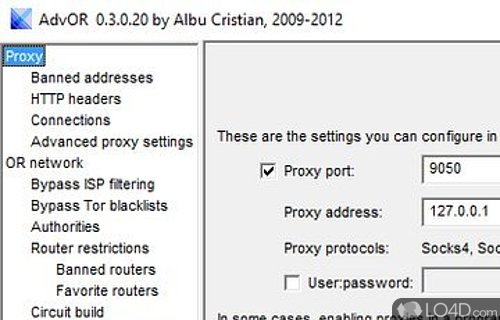 A separate x64 version of Advanced Onion Router may be available from Albu Cristian. This download is distributed as advor-0.3.1.5.zip. We have tested Advanced Onion Router 0.3.1.5 against malware with several different programs. We certify that this program is clean of viruses, malware and trojans. 3.4 out of 5 based on 8 ratings.